Crispy, juicy and absolutely delicious! Our very best traditional homemade Greek chicken gyro recipe with fluffy pita breads and creamy tzatziki sauce for you to recreate this authentic Greek delight from scratch! Souvlaki with gyro is one of the most popular street foods in Greece ( skewers / suvlaki / suflaki ), that is known and loved around the world. 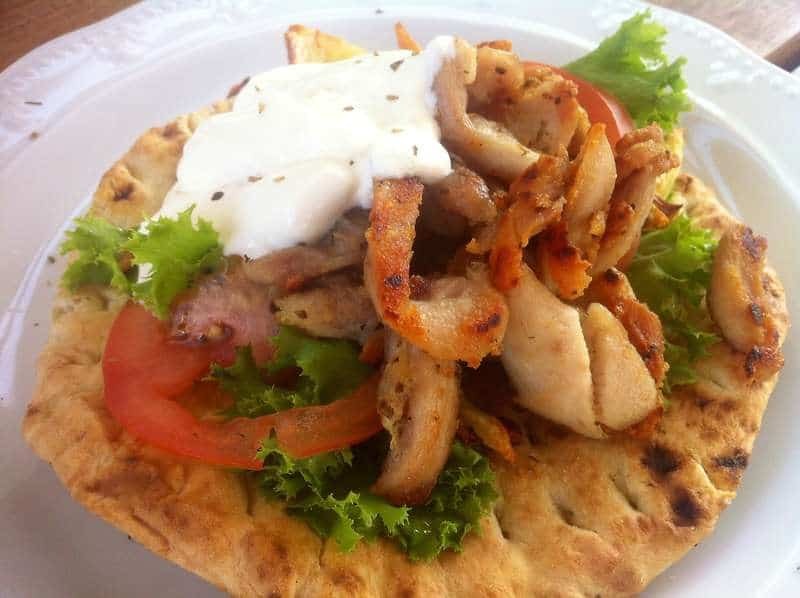 The traditional souvlaki with chicken gyro (yiros) recipe is actually a pita bread sandwich, filled with lots of spicy chicken, fresh juicy tomatoes, crunchy slices of onion and cooling tzatziki sauce. Simply irresistible! Souvlaki stands for “meat-on-a-skewer”, however the majority of Greeks and especially those from Athens call any type of pita wrapped meat a souvlaki, specifying the type of meat and method of roasting separately. For example Souvlaki with pork Gyros or Souvlaki with Chicken Skewers etc. The most important step in making this traditional chicken gyro recipe is nothing else but the marinade! For this chicken gyro recipe, the chicken is first marinated in a salt-based marinade (almi), along with Greek herbs and spices, to soak up all the wonderful Mediterranean flavours and then grilled to high temperature, to get all crunchy and nicely coloured. Marinading your chicken gyro in the fridge for half an hour will allow the aromas to infuse the gyro meat and give it the desired flavours. The best way to serve chicken gyro is nothing other than wrapped in a delicious traditional Greek pita. Finding the original Greek pita can be quite challenging as most supermarkets stock only the arabian style ones but you can most likely find them at your local Greek deli or amazon (here and here). However as we all know, nothing compares to home-made, so you can also make your own homemade pita bread with this super easy recipe. Of course tzatziki is the preferred sauce to garnish your chicken gyro and we have included one below as well as here. Don’t forget to season with some salt and paprika, sweet or spicy if you like an extra kick. Most Greeks enjoy their traditional Greek chicken gyro souvlaki with some potato chips so feel free to try adding some as well. Prepare this super easy Greek chicken gyro recipe for your friends and enjoy over some cold beer! To prepare this chicken gyro recipe, start by preparing the marinade for the gyro. Place a large saucepan over medium heat, add all the marinade ingredients for the chicken gyro and stir well. As soon as the water comes to the boil, remove the pan from the stove and let it cool. In the meantime cut the chicken legs into thin strips. In the meantime prepare the tzatziki sauce for the chicken gyro. Pour in a blender the olive oil and grated garlic and blend until combined. Remove the skin and seeds of the cucumber and grate it into a large bowl. Season with salt and pepper and leave aside for 10 minutes. Wrap the grated cucumber in a towel and squeeze, in order to get rid of the excess water. In a bowl, add the cucumber, the blended garlic and oil, the yogurt, 1-2 tbsps of red wine vinegar, a pinch of salt and blend, until the ingredients are combined. Store the tzatziki sauce in the fridge and always serve cold. Drain the chicken from the water and wipe with some paper towel. When preparing this chicken gyro recipe, to achieve the desired crunchiness sauté the gyro into a very hot large non-sticking pan for 2-3 minutes on each side, without stirring, until nicely coloured. Open one piece up to see if it is cooked (there should be no pink in the middle). While your chicken gyro is being cooked, prepare the pita breads. Preheat the oven to 250C. Use a cooking brush to oil the pita breads on both sides and season with salt and oregano. Place a large oven tray (upside down) at the bottom of the oven and place the pita breads on top of the tray. Bake for 2-3 minutes. Chicken gyro is usually served wrapped, like a sandwich. Spread some tzatziki sauce on the pita breads and top it with the chicken gyro, some slices of red onion, some sliced tomato and fried potatoes and wrap. For an easier version of this traditional Greek souvlaki with chicken gyro recipe you can serve with Greek yogurt or some mustard and mayonnaise sauce. Enjoy! Until now!! I found THIS gem and knew it was the one! Brilliant, using what is more a quick brine than a marinade, this delivers that perfect product; tender yet crispy, tasty and grilled, slightly salty and herby garlicky goodness! No yogurt rub on the meat!! That’s a satay. What you shared is the real thing!! I’ve used it a few times now and made a couple slight modifications to it which adjusted it to my preferences, but the credit is all yours Eli. I’m trying the pork recipe tomorrow, your lemon crispy potatoes, and dozens more. Thank you very much for sharing these with us all! Here are my slight changes to amounts, no ingredient additions or removals, just changes to the amounts of these items. This delivered more flavor punch without changing the profile at all. Absolutely incredible. I make the brine as indicated using the above modifications, and let it cool. I then use a 1 gallon ZipLoc freezer bag for the brining, adding the cooled brine (with the lemon halves and all) and chicken to the bag, then carefully seal all air out of the bag. I lay it flat on the bottom shelf of my refrigerator for 2 hours. This gets brine to all the surface area of each piece of the chicken. Remove the chicken from the bag (dump it all into a bowl if easier) and on some paper towel, give it a quick squeeze to absorb some of the brine Then cook as the recipe calls for. The end result is absolute heaven. Eli, thanks again for sharing all these wonderful recipes, I’m grateful and excited to make many of them! Very Nice will give this recipe to my son George he loved the Gyros we had in Greece last year. Thank you for so many lovely Greek Dishes. When I married my beautiful Greek Husband who migrated with his single brother and without his family in 1958, it was so hard to find any recipes here in Australia that I could use to give him the traditional food of the Dodecanesse. There was only one book published by Tess Mallos which we could use to cook home style food for our Greek husbands.